Local Artist attacks Clown with chainsaw claiming temporary insanity caused by Red Tide. 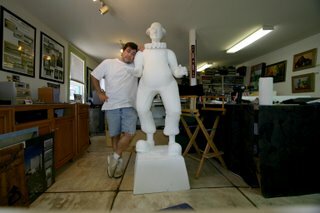 Artist states that without Gold Bond Powder he would have become Florida's first serial clown killer. I really wasn't intending on painting one of these.....for those that don't live here in sunny Sarasota, there will be something like 50 of these clowns, some are male, some female, hanging, or standing, around downtown Sarasota. This is a program developed by and for the benefit of TideWell Children's Services Program to raise $1,000,000 to establish a children's hospice program in Sarasota. So it's for a great cause, I'd say. Seriously though, this guy is about ready to have major surgery. I can't wait....I always wondered what it would be like to be a doctor. I certainly have the appropriate handwriting. 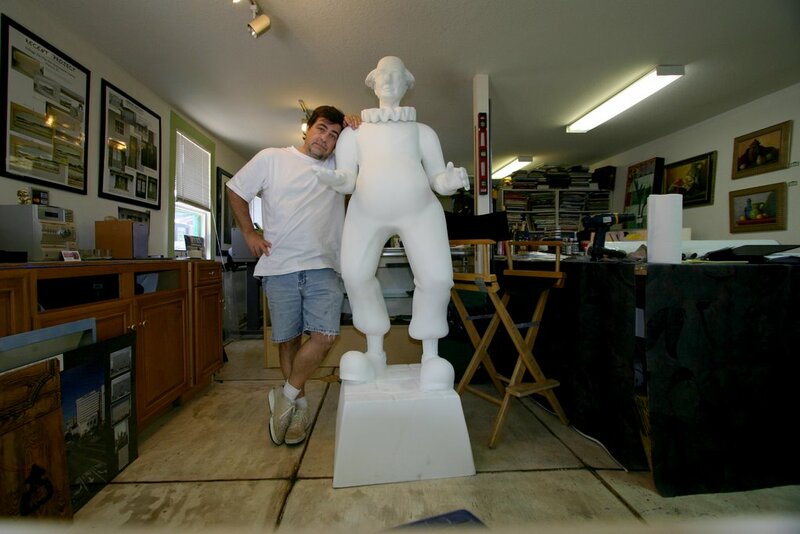 Many years ago I worked for about six months for local sculptor Jack Dowd I worked on Butler Number Six and learned a lot in that short time.....mostly, that it was actually possible earn a living as a working artist. So there will be a little bit of what I learned there in my buddy in the photo, I'm sure.